In a new report on Quebec’s Valeant Pharmaceuticals, short-seller Citron Research says the stock is "toxic" and predicts the drug company will soon have difficulty paying its debt as it undergoes investigation. In a new report on Quebec's Valeant Pharmaceuticals, short-seller Citron Research says the stock is "toxic" and predicts the drug company will soon have difficulty paying its debt as it undergoes investigation. Although Valeant said last week it was cutting ties with the Philidor network of pharmacies, Citron is predicting it will be tainted by revelations that two of the largest pharmacy benefit providers in the U.S. had cut ties with Philidor. As a short-seller, Citron takes the position that Valeant stock will sink further. Valeant has gone from over $200 a share in the middle of October to $129 today. Citron, which first broadcast its concerns over the transparency of Valeant's accounting practices Oct. 21, is predicting it could fall to $50. Citron's Andrew Left emphasized he has no new revelations about Valeant, saying the research firm does not have deep enough pockets to withstand legal action it might face if it released information from insiders. That helped Valeant stock rise on Monday, despite the harsh assessment delivered by the analyst. By late afternoon it was up nine per cent to $131 Cdn. In an interview with CNBC, Left said his legal team had advised him to leave further investigation of Valeant to the "mainstream media." "My goal is to get a conversation started about a stock, about a company," he said. Valeant spokeswoman Laurie Little highlighted the lack of new allegations in an email statement to CBC. "Citron admits in its latest report that it has no substantiation for further allegations against Valeant," Little wrote. "Given that its last report was filled with demonstrably false statements about our business, we are not surprised, even as Citron continues to mislead investors in an attempt to profit by driving down our stock. We will continue to focus on running our business in an honest and transparent manner and meeting our commitment to the patients who depend on our products and the doctors who recommend them." Goldman Sachs also issued a report Monday lowering its recommendation on the Canadian pharmaceutical company to "neutral" from "buy." "Given the events that have transpired very rapidly in recent weeks that have raised many questions about certain aspects of VRX's business model, we have less confidence the market will reward the stock any time soon without clarity as to the path forward," Goldman analyst Gary Nachman wrote in the report. Citron's report says it believes Philidor's relations with the health insurance agencies amount to insurance fraud and could prompt insurers across the U.S. to investigate claims for all Valeant dermatological drugs. "This reputational damage is not so easily undone," the report said. 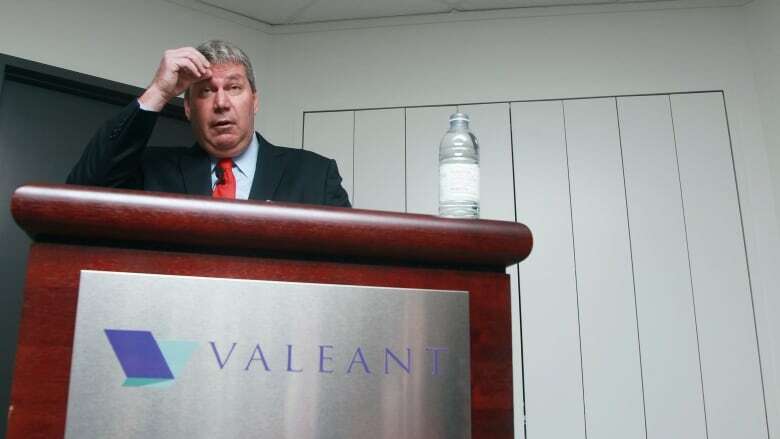 Valeant can no longer raise drug prices because it is now under scrutiny by U.S. lawmakers and its strategy of serial acquisitions can no longer continue, Citron said, raising concerns about the company's revenue prospects. The company will also be busy responding to dozens of subpoenas related to non-disclosure and to how drug sales at Philidor-related pharmacies are handled. Its stock will be under suspicion by investors until its relations with Philidor become more transparent, the report said. Citron said it stands by its comparison of Valeant to Enron, the power company that folded amid a web of accounting fraud in 2001. "Citron Research stands by our Enron analogy, as we now see that Valeant has engaged in manipulation of the insurance reimbursement system, and very possibly the law, to alter their financial results," it said. Hedge fund investor Bill Ackman, who owns a large chunk of Valeant stock, held a lengthy conference call Friday to defend Valeant. Ackman said he believes these kind of investigations are "normal" for big drug companies and the stock will eventually recover. Late last week, Valeant appointed a prominent lawyer to advise its board in a review of its business relationship to Philidor. Mark Filip of Kirkland & Ellis LLP is a former deputy attorney general of the United States.